Personally I think they are bored out of their minds KIDDING... it is VERY funny that they would select a couple that doesnt warrant much personal media attention though....awwww Hugo Grint... lets take RJ (Rupert Jr. )...ok next round of drinks are coming-Luciana I will make yours less stronger That is me nowadays-two drinks tops! LOL Why do I have the urge to sing Garth Brooks' Friends in Low Places? We're always ready for a drink here - it's becoming a habit! 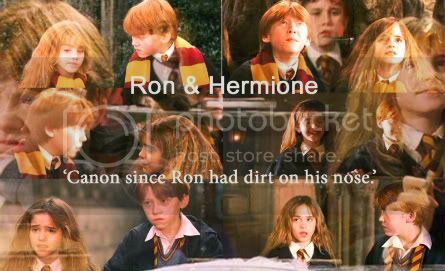 Emma was totally speaking HER mind there, as Hermione doesn't have LOTS of redheaded babies... just two! Luciana, i'm curious too! It just seems so random that a betting agency will accept money on their engagement when, as far as we know, they are not even dating! So, even though people decide not post here, R/E are obviously quite popular! Edited by vida, 03 November 2010 - 12:01 AM. I read that David Heyman told them about the kiss scene just one day previous the shot!! I'd have liked to see their faces when he told them that! ^ I'm guessing that as soon as they got into the privacy of their separate dressing rooms their faces where quite similar to that emoticon's that you just posted Luciana! Tell us about the fantastic Hermione, is she your dream girl? Oh my! She's quite scary and bossy. In this film she's brave, and took matters in her hands. Is there a make out scene between you and Hermione that we should look out for in the movie? Yeah. In part one, we kiss. ( maybe it is wrong). It's quite a strange thing to do cos we've known each other half of our lives, we practically spent everyday with each other. It took us five times to got a good shot. It was quite weird, but it ended well. i love R/E, they are totally adorable! Have you all seen tha latest interview of Emma with Marie-Claire? She's totally rockin' the short hair! I love it! Anyway, I'm still not buying it! Our mystery shipper speaks? YAY! Sing it from the Roof Tops girl! I see you on the forums often, but we never or rarely seem to hear from you, so it's great to have you pubically endorsing the ships of R/E and R/Hr! Okay vida, this is the last straw! I've had enough! I don't care that I don't possess any media credentials, some how, some way, I'm gonna interview Rupert and Emma. And I'm calling them out! My first question for Rupert as I look him straight in the eyes is going to be, "So, how was it kissing your sister?" and then keeping a straight face and looking Emma directly in the eyes I'm going to ask, "So, how was it having to kiss your brother?" I don't know what I'll ask after that, but that's how I'm kicking off my respective interviews with them! Maybe I'll have to ask that on their next movie phone interview! Ya think my question will make it past their question screening? I bet Dan would ask it for me if I tried! 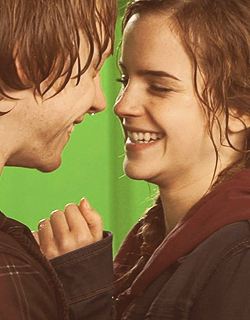 Maybe we'll have an 'Unscripted' interview this time, like we did for OotP? We should totally submit those questions on behalf of all forum shippers! The more, the better! an unscripted would be so so awesome, Dan would so tease them and embarrass them! Yes!! An Unscripted interview, please!!!!!!!! That would be great!! ^ Well thank you for sharing your thoughts here then Katie! I know it can get busy with all the R/Hr and R/E news and you certainly don't want to spread yourself too thin. That's why I keep my posting strictly to this forum. I know others can handle multiple forums, but I just might burst from the shear volumn of R/E and R/Hr love if I did something like that! Hey wait a minute... this chalk is carving those words into the back of my hand! Please Miss, don't punish me... i was just commenting on the fact that Emma altered her answer this time around, but quickly pointed out that i still don't believe it! I think you also mentioned before that Emma went from feeling 'very nervous' about the kiss to 'somewhat nervous'. Oh, Dan would be in his element!